Today I'm going to dig deep into the archives of music history to tell you about a band that was responsible for starting the careers of three of rock's most famous guitarists: Eric Clapton, Jimmy Page, and Jeff Beck. The Yardbirds were a blues-based band that broadened its range into pop and rock, the Yardbirds had a hand in many electric guitar innovations of the mid-1960s, such as feedback, "fuzztone" distortion and improved amplification. After the Yardbirds broke up in 1968, their lead guitarist Jimmy Page founded what became Led Zeppelin. Eric Clapton replaced the original guitarist in 1963. the Yardbirds signed to EMI's Columbia label in February 1964. 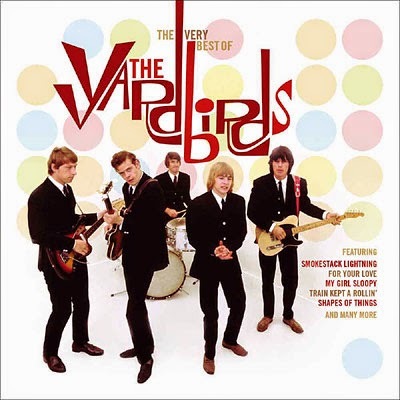 Their first album was the "live", Five Live Yardbirds, recorded at the legendary Marquee Club in London. Clapton, at the time a blues purist, left the group in protest on 25 March 1965 and joined John Mayall & the Bluesbreakers. He recommended Jimmy Page, a prominent young studio session guitarist, as his replacement. Unwilling to give up his lucrative gig and worried about his health, Page in turn recommended his friend Jeff Beck. Beck played his first gig with the Yardbirds only two days after Clapton's departure. After a tour stop in Texas in late October 1966 Beck was fired both for being a consistent no-show and difficulties caused by his perfectionism and explosive temper. The band continued as a quartet thereafter, with Page as sole lead guitarist; he subsequently introduced playing the instrument with a cello bow (suggested to him by session musician David McCallum, Sr.) and the use of a wah-wah pedal in addition to his fuzzbox. "For Your Love" is a 1965 single written by future 10cc member Graham Gouldman and performed by The Yardbirds. It peaked at number three on UK Singles Chart and became their highest charting single in the U.S., peaking at number six.